My rating: 8/10. Expanding bracelet watch. Affordable digital timepiece. Hello, today I’m doing a Casio A158WA-1 review. I’ll admit this model looks very similar to the previous retro Casio I looked at on the face of it. But this is actually a higher end model throughout so it’s well worth considering. I’ll be pointing out some of the better specifications and features of this watch in this review. I hope you enjoy this Casio A158WA-1 review below. I love this practical yet stylish watch design from Casio, it’s sure to compliment most outfits be it informal or dressy, the retro design has proved popular for some time now. The watch features a silver stainless steel case with a vivid black digital dial. The LCD screen is nice and easily visible at night with its back light function. 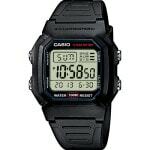 This particular model from Casio features a higher end mineral crystal glass. This type of glass is specially hardened to make it extra resistance to scratches and scuffs. It also offers a good level of shatter resistance. Powering the watch is a common Japanese quartz movement. Quartz movements are popular due to their accuracy and reliability requiring very little in the way of maintenance. Like a lot of the other digital Casio watches I’ve featured recently this model also has a smaller design. The casing diameter measures 32mm and has a thickness of 8mm. This is in keeping with the traditional smaller design of watches. This strap differs a lot from all the other models I’ve featured recently. That’s because this model has a stainless steel expanding strap. Expanding straps are popular due to their ease of use with how quickly you can take them off or pop them on. 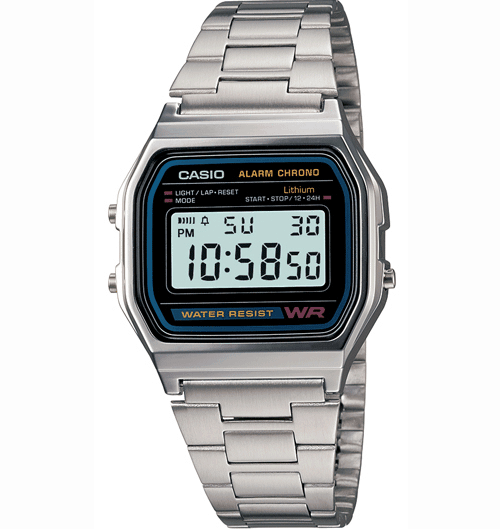 This watch features many of the popular extras you find on most retro Casio timepieces and more. There’s the stopwatch, alarm, date display, chronograph, lap timer, 24 hour time display, and light up display. A downside to the watch is that it only has a 30m water resistance rating. A 30m or 3 Bar rating makes this watch suitable for everyday use. Splash/rain resistant. Not suitable for showering, bathing, swimming, snorkelling, water related work and fishing. Band Stainless steel expanding strap, standard length, 18mm width. Case Chrome plated resin casing, sizing diameter: 35mm and thickness: 10mm. Dial Digital display. Mineral crystal glass window lens. Overall, as with many of the other retro Casio watches available I’m a fan of this model. I like the idea of an expanding strap and I’m sure there’s some people out there that will prefer this over a stand style strap. The watch has an array of useful features and even comes with a higher end mineral crystal glass. A great retro watch for a very affordable price. Hope you enjoyed this Casio A158WA-1 review. Find more watch reviews below.